A young footballer leaves her home city, wins trophies, stars on the international stage, sets a new league goal-scoring record and returns to set up an academy in the community. It's a classic story of 'local girl done good' who now wants to give back. But a key difference with Nikita Parris is that she has done all of the above before the age of 25. Raised in Toxteth, Merseyside, the former Everton youngster has set up the NP17 Academy - named after the number on the back of her shirt - to help girls from deprived regions of the city. "That community gave me life and gave me an opportunity - that's what I want to do for these girls," the England forward told BBC Sport. "I want to give them an opportunity to be successful in whatever they choose. Within inner city areas, there's always good and bad. You've got to be in and around the right people. "It's because of the people in that area that I am where I am today. People in my area put in the time and effort with me, especially my teachers at school and my youth leaders." The full-time course started in September, with 14 teenage girls aiming for a level-three sports qualification. But it's not just all about football as Manchester City's Parris explained. "The course itself didn't target just football players - it targeted all girls across Liverpool to come and get involved in women's sport," the 24-year-old added. "Sometimes, when we talk about football, we automatically think players, but it's important to understand there are many different roles that football can be a part of. "I always wanted to help develop the next generation of people involved in women's sport. But it didn't have to be players - it could be doctors, it could be physiotherapists, it could be coaches. "I am really proud of it. I've always wanted to give back to women's sport, because it's played a massive part in my life." The academy at the City of Liverpool College is also being supported by Puma, who are donating sports equipment for the students, with further help from Liverpool City Council and the college. 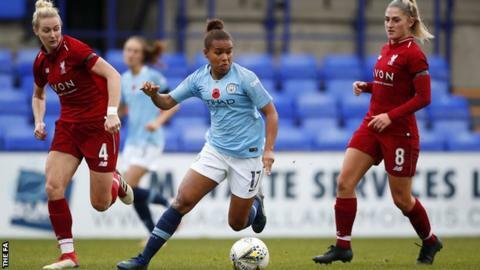 Parris, who signed for Man City in January 2016 following an initial loan spell from Everton, graduated from her sport development degree at Liverpool John Moores University earlier this year. But she does not want to simply give her initials and shirt number to the new academy programme - she is a visible part of the course too. "I go back and I just pop in on different sessions, whether it's when they're playing seven-a-side games on a Wednesday or in a classroom on the Tuesday, I just pop in and see how it's going. "I'm not just a person who's in the background supporting it - I really want to be on the front line, helping these girls. It's good for them to know that, if you put the hard work and desire in to something, you can achieve." And she is hoping to achieve bigger things with England next summer, after helping them qualify for 2019's Women's World Cup. On Thursday [17:00 GMT kick-off] the Lionesses face Austria in an away friendly, before Sunday's home international against Sweden in Rotherham, as Phil Neville's side continue their preparations for the tournament in France. England skipper Steph Houghton will miss Thursday's game to save her 100th cap for Sunday's match on home soil, with Barcelona's former City and Everton star Toni Duggan taking the armband in Austria instead. Parris, who like Duggan was born in Liverpool, netted six times for the Lionesses during qualification. But her form for her club has arguably been more impressive, having scored nine league goals already this term, from eight WSL appearances. Her brace at Liverpool on 4 November saw her surpass Eniola Aluko's previous league record of 36 goals in the WSL, which began in 2011. "Over the last two to three years I've really kicked on under the guidance of Nick [Cushing] and his staff," Parris said. "There's so much talent in our squad but we have got the right staff around us to mould us into the players we know we can be. "I'm happy with how my performances are going this season, but it's all about consistency. There's no point in doing it for one season and not the next, or one game and not the next. "Right now I'm in good form and I hope it continues because there's a World Cup at the end of the season." City - who Parris helped win a treble of domestic trophies back in 2016-17 - are second in the WSL after eight games, three points behind leaders Arsenal, who have a game in hand.